Your driver will be waiting at Amman (AMM) airport to take you directly to your hotel in Madaba - a 40-minute drive. There are no activities planned for today. Please keep in mind that hotel check-in time is typically after 2.00pm. Early check in is not guaranteed, but if you do arrive early luggage storage is available at the hotel. There will be time to rest and settle in before you meet your tour guide for the trip. He'll be happy to answer any questions about the journey, and to make sure you're briefed on the program for tomorrow. After breakfast we head Mount Nebo, a hilltop site with sweeping views down to the Dead Sea and west across the Jordan River towards Palestine. On a clear day you can see Jericho and even Jerusalem from here. For centuries Christians have believed this is the place where Moses died, within sight of the Promised Land, having led his people out of slavery in Egypt. In the early Christian period Mount Nebo became a place of pilgrimage, and it was at this time that craftsmen made the beautiful mosaics floors that have been excavated here over the last 80 years. 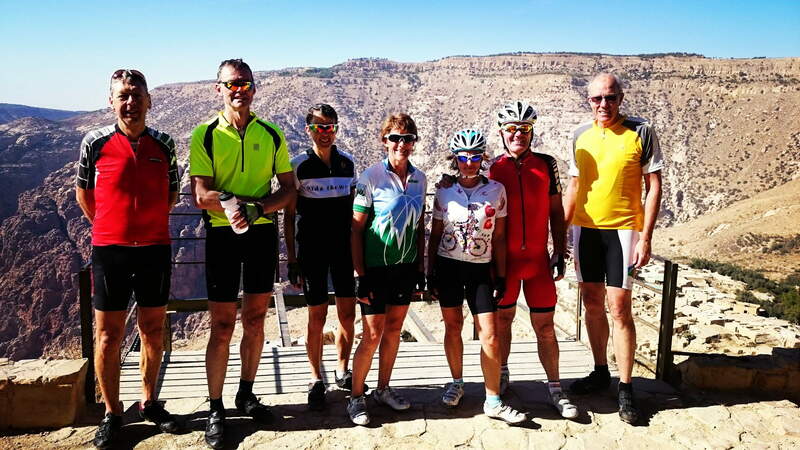 From Mount Nebo a short transfer (20km) on Kings Road south to Libb, mount our bikes and ride west for 16 km on a hilly narrow road through the villages of Bani Hamida to reach the hill of King Herod’s palace remains where John the Baptist was imprisoned and beheaded. We then go to the nearby village of Mukawir where we get hosted by a local family over lunch—a great opportunity for a genuine local interaction opportunity. This is part of our responsible tourism programs to support the local communities at the places we visit. 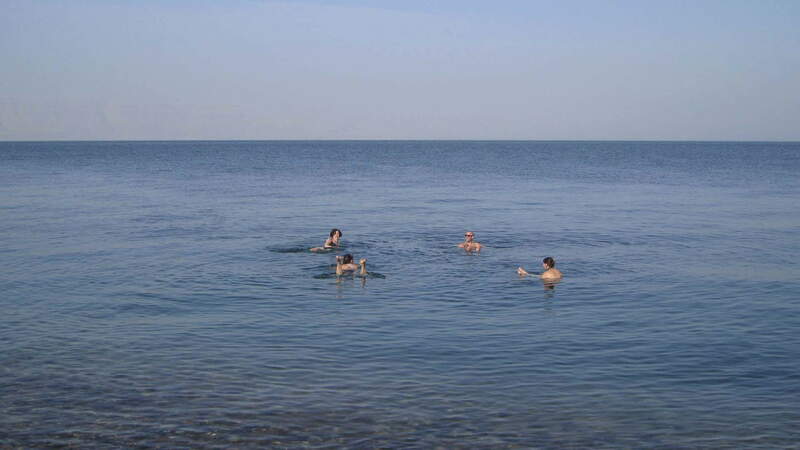 We then ride downhill a 1000 meters to the Dead Sea—the lowest spot on earth to enjoy the Dead Sea’s special buoyancy experience. In the afternoon we transfer south, bypassing the town of Tafila to Dana village and to our simple and friendly hotel. Here you are on the edge of Jordan's largest nature reserve, a spectacular wilderness of canyons and mountains that rise above the Great Rift Valley. Do not be intimidated by the length of today's ride - the last 15km are entirely downhill and almost effortless. A short transfer brings us to Shobak, another in the great chain of castles that guarded the eastern edge of the Crusader kingdoms and watched over the old trade routes that ran from the Red Sea coast up towards Damascus. It was built in 1115 by King Baldwin, one of the leaders of the First Crusade and the first to be crowned King of Jerusalem. Like Kerak, it was part of the principality governed by Raynald of Chatillon in the late 12th century, and it was here at Shobak that Reynald built the ships that he then transported to the coast at Aqaba and used to launch a raiding party towards Mecca. The castle was taken by the Arab Islamic armies of Salaheddin (Saladin) in 1189, and extensively restored in the 14th century by the Mamluk dynasty. There are two churches inside the castle, and if you ask your guides they will show you the steep underground tunnel that the Crusaders cut to get down to the water spring below the castle. Leaving the castle, we ride along an excellent dirt track that contours around the edge of the Eastern Plateau and offers magnificent views down into the Wadi Araba. There are some short, steep climbs along the way, but this is a really enjoyable section of the ride, and the support vehicle is always at hand. Eventually we rejoin the King's Highway and continue south towards Wadi Musa. This little town is right on the edge of Petra's archaeological park, and will be our base for exploring the ruins. You'll check into a comfortable hotel here for a three-night stay. This morning is free-whether you'd like to pay Petra another visit or rest, the choice is yours. In the early afternoon, we shall ride on the tarmac road from our hotel to Beida (12 km north of Petra). We'll stop to visit the site of Little Petra before we continue riding on an interesting off-road track that leads to the ledge behind the mountains of Petra at a secluded area which provides amazing panoramic views of the breathtaking Wadi Araba desert to the west. We will stop at a viewpoint for a while to enjoy the scenery before we retrace our tail back to Beida and transfer back to our hotel. You begin with a short transfer by vehicle, getting on your bikes at the village of Delagha and heading south on an unsurfaced desert track. After a couple of hours you reach an old caravanserai at a place called Humaimah, where you stop for lunch. After a good rest you continue south until we reach Jordan's main north-south road, the Desert Highway. Here we put the bikes on the van and drive south to Wadi Rum, where you meet our Bedouin hosts and transfer to their 4x4 jeeps to get to your camp in heart of the Wadi Rum's protected area. There'll be time to relax and take in the sunset before enjoying a Bedouin feast of meat and vegetables cooked in the zerb, an oven of fire-heated sand and stone. If you're still not tired out by the day's adventures you can stay up round the fire, talking and laughing with your Bedouin hosts and watching the night sky. Your accommodation is a simple but comfortable Bedouin campsite, with a traditional goat hair tent divided into twin ‘rooms'. There are proper toilets and showers on the site (go easy on the water), as well as shaded seating areas for relaxing and dining. Every guidebook to Wadi Rum repeats the description written by T.E. Lawrence of Arabia almost century ago, and with good reason. "The Arab armies would have been lost in the length and breadth of it," he wrote, "and within the walls a squadron of aeroplanes could have wheeled in formation. Our little caravan grew self-conscious, and fell dead quiet, afraid and ashamed to flaunt its smallness in the presence of such stupendous hills. Landscapes, in childhood's dream, were so vast and silent." After a breakfast in the peace and quiet of the camp you'll join your Bedouin guides for an exploration of Wadi Rum by jeep and on foot, exploring the incredible eroded cliff faces, the ancient rock inscriptions, and the red sand dunes of the desert. At a shady spot you'll enjoy lunch, tea made on the fire, and maybe a siesta, before heading off in the jeeps towards the Disi mudflats - a vast plain surrounded by spectacular sandstone formations. 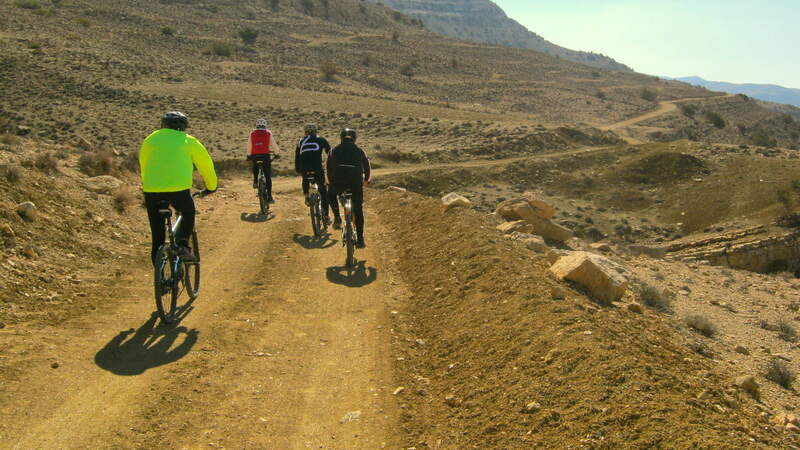 This is a great place to enjoy a bike ride on level ground and to take in the scenery of colored sandstone mountains. At the end of our ride we will meet our bus and transfer back north to Madaba for the last night. 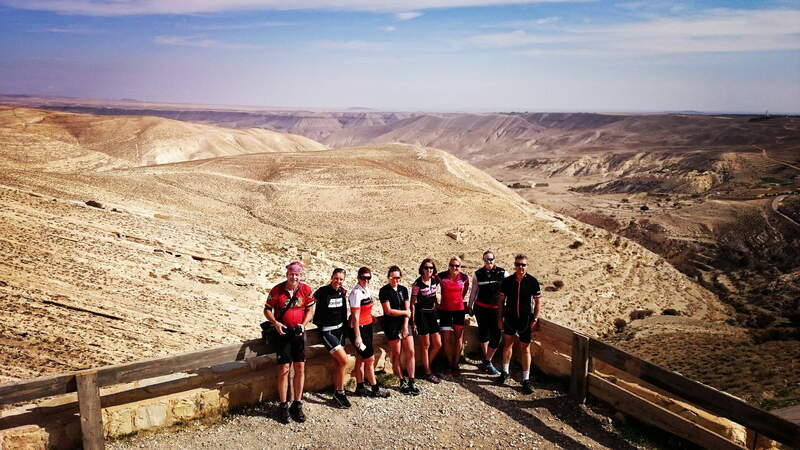 "We have been biking in Jordan and especially the off-road section and biking through the desert we have enjoyed very much, and this was the main reason for selecting this trip. It was also good to make side trips to historic places like Mount Nebo and Mukawir Palace as well as a trip to the Dead Sea. We have been very pleased with the professional guidance and detailed and accurate program"
"It was a fantastic trip, superbly organised and executed. I enjoyed the variety of the cycling. the group size of 8 was perfect - not too large or small. The staff (anas and Atev) were great fun, highly knowledgeable and worked extremely hard. the route was amazing in its variety, and the whole experience was on the right side of chalenging ie wasnt too hard to stop being fun." "An excellent holiday. I most liked the last 2,5 days, biking through the dessert. That was magnificent. The performance of the guide and support crew was great. One comment through. Try serving lunch earlier than 14.00/14.30 hours (especcialy as you start early with biking)"
"A terrific trip. Atef and Anas went did a fantastic job in leading this trip and making sure we were all happy. 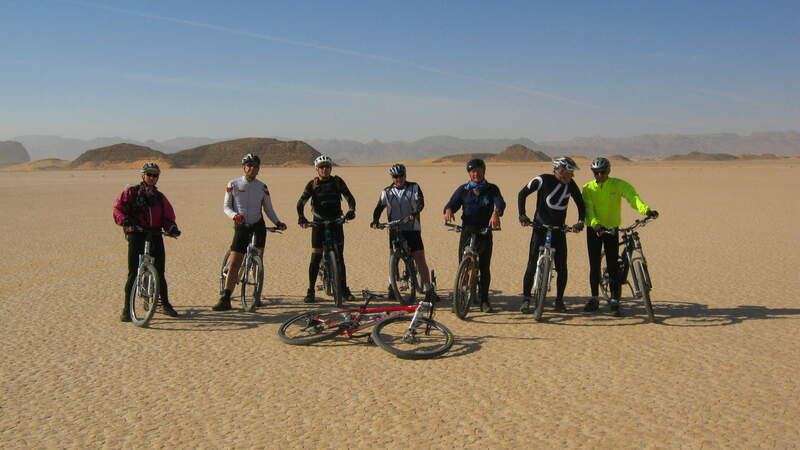 Off road biking in the desert arriving to Wadi Rum was the highlight for me!" "We loved the home stay and the Bedouin fixed camp. The other hotels did the job, but were not particularly notable or memorable. Raslan and Atef were excellent guide and support. We felt safe in their care and appreciated their deep knowledge of the the country and cycling. A bit more info on the cooler temperatures this time of year would be helpful. We were fine and had the clothes we needed, but would have been even more comfortable with a few more cold weather options." "An extremely interesting and quite varied trip. Seeing Petra again and more of it was great. Fantastic and varied mountainous scenery. All good really. Raslan was a very good leader . Well organised and kept large group going to meet demanding schedules. One thing to note is torch and sandals needed for swimming. Cold at times so need to emphasise adequate on and off clothing essential incl full finger biking gloves." "We embarked on this journey with very little knowledge of this country or its people.After 9 days with Anas and Atef we felt informed and very comfortable and happy in beautiful Jordan. Everything Terhaal advertised was delivered as promised-in fact the experience was so much more than we could ever have hoped for that it is hard to put into words. Our guides were magnificent-so knowledgable, capable, encouraging, supportive and FUN! Accommodation was outstanding-we slept especially well in the "no star" places!The food was delicious-Atef is an exceptionalcook and coffee expert. Anas is an amazing cyclist, patient,kind and helpful. The bikes were very good quality with really comfy seats and the 4x4 pick-up was perfect for the job. We can't recommend Terhaal highly enough.This really was a trip of a lifetime and we feel very fortunate that we "found" them. Terhaal is a wonderful company with an admirable philosophy and work ethic.Travel with them and you are in for a fabulous journey!" "Good organisation and great guides made this a really fantastic holiday. Thanks to Raslan and Atef for showing round their beautiful country and looking after us so well." "Was a fantastic trip guys, thanks for all your hard work putting it together. Atef and Raslan both worked so hard to make the trip enjoyable for us. Atef's roadside meals were great and Raslan was a very energetic cycling guide. Logistics of the trip were seamless, everything (eg transfers, hotels, riding water/snacks etc) was so well organised. The rides themselves were incredibly beautiful and quite varied too; a good mix of hills, flat and downhill, as well as on & offroad. And importantly, whenever we were on busy roads, the support vehicles gave very good and much appreciated protection from the traffic. As an aside, I think the adjusted moderate program that we did has sufficient riding in it. I think the original program would be far too demanding for the type of person that would likely come on a trip like this, who also wants to do some sightseeing and relax a bit. I really enjoyed the extra night we spent in Wadi Rum on this trip. Although Aqaba also seemed very nice for the day we were there, I'm glad we spent more time in Wadi Rum rather than staying the night in Aqaba. Although I would also be open to having an extra night in Aqaba in addition to the 2 nights in Wadi Rum! For the next trip, I would suggest you try to get to Dana earlier in the day if possible so there is some time to explore that area, and maybe do a hike. Dana seemed very beautiful but unfortunately we didn't really get a chance to see it properly. Having said that, the ride down through Wadi Hasa on the way to Dana was spectacular too, and it would be a shame to miss it. Maybe try to leave Karak earlier if possible. Would highly recommend this trip to anyone wanting to combine some amazingly beautiful cycling with incredible sightseeing and interaction with local people. The guides Atef and Raslan were unfailingly helpful and enthusiastic in their organisation of the trip. The logistics were seamless. Was a fantastic trip around a beautiful country with so much to offer." "Hellooooo once again Rakan, I'm still in Jordan but Filomena went Portugal yesterday. I wanna tell you everything is ok and the trip and your coutry are super. CONGRATULATIONS to all your team, specialy to you and Atef. You are professionals. I hope Atef arrive well in the other day with the bikes.Please send him my best regards and admiracion because is really a very pleasant person and an excelent guide. I will send you fotos from the ride when i arrive to Lebannon. thank you very much"
Moderate : A reasonable level of fitness is required, as these trips can require sustained endurance levels along steep trails and uneven paths. Canyoning trips may include few abseils (rappels), long hikes and occasional climbs. Biking trips include a series of up and downhills but nothing too strenuous. A support vehicle will be always available so weary travelers will be able to hitch a ride. A typical trekking day would be walking 4 to 5 hours a day including a 2 hour ascending a mountain. If you are already in Jordan, then your meeting point becomes at out hotel in Madaba (Hotel name and address will be provided upon booking). During the trip your baggage will be carried by bus and by 4WD vehicles. The only baggage weight limit is that imposed by the airline. However, we ask that you restrict your luggage to one main bag plus a small daypack. In general we recommend that you travel as light as possible as this will make transiting between airports and carrying your bag to hotel rooms a lot easier for you. You may find that wheeled luggage is more convenient on a trip of this nature. Temperatures in Jordan can be hot, with little rain from late spring through until late autumn. The heat can become extreme during the summer months of July and August. In the months of November to March it can be cool at night, particularly in the desert where the temperatures can drop to 5C or even less. Even in the hot months out in the desert it can get cold at night. Jordan is a predominantly Muslim country and tends to be quite conservative, so you should dress accordingly. As a general guideline, shoulders and knees should be covered at all times. A light water and windproof jacket is useful and a hat is essential. From mid November to late February, a sleeping bag is essential for your nights in the desert. At other times a sleeping sheet will suffice. Loose, lightweight, long clothing is both respectful and cool in the heat. > Travel documents: passport, visa, travel insurance, air tickets etc. > Foot powder or Vaseline can be useful against blisters. > A warm sweater for the nights for tours between November and March. We advise you to use your own bike for this holiday, after all it is the bike you know best and will provide you with the best riding experience. If you bring your own bike you will need to bring spares specific to your mountain bike. A biking helmet must be worn when riding. You should make sure your bike and equipment have been thoroughly cleaned prior to packing. Please note that we cannot guarantee against small scratches and paintwork damage involved in the loading and unloading from support vehicles, so please ensure that you have adequate cover for loss, damage or theft under an insurance policy. We recommend SEMI SLICK tyres for this trip. Your Bike MUST BE at least a mid level Mountain Bike such as a Specialized Rockhopper or a Trek 6500. Please contact us if you are unsure about the suitability of your current bike. Rear suspension will make the journey more comfortable but is not essential. We cannot stress enough the importance of ensuring that your bike is in perfect working condition before you start this trip. It is VITAL to ensure it is THOROUGHLY SERVICED to guarantee it is in good mechanical order before departure. If you are not mechanically minded, get your local bike mechanic to service it for you. We advise you to use your own bike for this holiday, after all it is the bike you know best and will provide you with the best riding experience. Otherwise, you are most welcome to use on of ours. We have a full range of well maintained 2010 Giant Yukon mountain bikes (sizes 15, 17, 19 and 22 inches), with front suspension, V-brakes and Shimano gearing are available. This is an active trip, and it is highly recommended that all travelers be in good physical health prior to arriving in Jordan. We also advise all our guests to consult their doctor beforehand. Group leaders reserve the right to exclude (without refund) clients from the trip if the group leader believes that that client's own health may be endangered by the journey, or if the group leader thinks that the client's participation might compromise the enjoyment, health, or safety of the group as a whole. This is an active holiday. It involves cycling in hilly country. That will require a decent level of fitness to be enjoyable. We recommend you objectively assess your fitness level in conjunction with reading the itinerary to ensure this trip is right for you. Make sure to read the Physical Rating section above. Physical Rating: Is this trip good for me? Do I need to be super fit to do it? This is a moderate biking holiday designed for the regular rider with a good balance between time on the saddle and time spend on each attraction site. Most of the riding on this trip is straightforward on quiet tarmac roads or dirt roads and desert tracks. There are short sections of village footpaths and pockets of soft sand when crossing the desert on days 7, but very little that could be described as technical. There are some days involving amounts of ascent, however, the support vehicle is available pretty much throughout. This allows for groups of mixed ability and also provides the option (for those who are finding the going tough) to skip the most testing of the uphill grinds. We have rated this trip as moderate but keep in mind this is an adventure holiday and you will be on the move a good deal. You do not have to be super fit, but a good level of fitness is required for you to enjoy it.